Deesigns by Nina Dee: Pals Holiday Catalog Blog Hop! Glad you could join us for some holiday crafting with the Stampin' Pretty Pals! You've probably hopped over from Sherrie Gross at Stampin Sunshine! I'm stop number thirty, the final stop on the Pals Hop and I'm glad you hopped in! I'll help you "hop along" from blog to blog where you'll find great ideas for Stampin' Up! projects featuring the new Holiday Catalog! Should you hop off course, simply click on any of the links in the Pals Hop line-up at the bottom of this post and you'll be back on track. I knew that I wanted a card with these two main elements, but the card really began to evolve as I was thumbing through some of my DSP. I came across this gorgeous print in Rich Razzleberry from the International Bazaar DSP and I knew that I wanted a nice piece of it across my card. Everything else just seemed to fall in place from there... I added a piece of Baja Breeze DSP and my sentiment stamped from the Just Believe set. Then I attached my leaf, stamped in Basic Gray ink on Whisper White card stock. I added a quick little flower made with the Floral Fusion Sizzlits die and the Boho Blossoms punch and tucked in some Baja Breeze Seam Binding Ribbon. I like the extra touch of Rich Razzleberry on my card. Now hop along for more inspiring ideas starting with Lynn Hoyt at Cattail Designs, stop number one on the Pals Holiday Catalog Blog Hop! Thanks for "hopping" by! Nina - this is beautiful! I love the white woodgrain and the lovely layers of color and texture. beautiful. the really cool thing is that the colors don't lock it into autumn (which isn't here yet)! I never would have put those colors together, but I absolutely LOVE them together! Thanks, Nina! 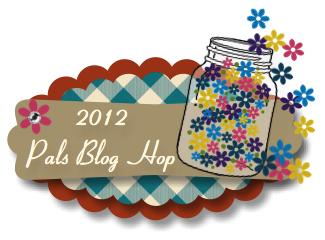 Your hard work paid off, the Blog Hop looks like a huge success! This is a very pretty, subtle, and calming card. Good job! Nina, I love the look of this card. It's beautiful!! Clean and crisp and love the color combination. So pretty, Nina! Love your color combination. I need that folder....thanks for ALL you do! Love everything about your card from the paper, design to embellishments. Perfect. Deesigns...how clever! Can't wait to see what your future blog entries hold! Great layout and gorgeous colors!! You've convinced me what the next item I need to order is!! Beautiful card. Another set to add to my list. Oh my! Thanks for organizing this great blog hop. Love the texture and LOVE this color combo! Beautiful card! Gorgeous card! I never would have thought to use the wood grain embossing folder on white...it's beautiful. Thank you so much for all your hard work every month organizing these hops. I think you do a wonderful job! Plus - Happy Belated Birthday!! Absolutely stunning. Love it all.